McKee, February 9th 2019, peacefully at hospital, Edward John, dearly beloved son of the late John and Florrie McKee, late of 62 Greencastle Road, Kilkeel and devoted brother of Myrtle and the late Edna. Funeral Service on Tuesday at 2.00pm in Mourne Presbyterian Church. Family flowers only, please. 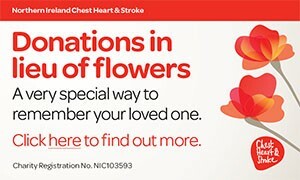 Donations in lieu of flowers for Chest, Heart & Stroke Association c/o Mrs Myrtle Shaw, 62 Greencastle Road, Kilkeel BT34 4JJ. I am sorry to tell you that Edward John McKee has passed away.